It is now 2015 and I realize I haven't updated the blog since October. That is quite a bit of time. I started this blog to keep everyone up to date on the triplets when they were little. It was too hard to talk to everyone and having one place to get updates made it easy for all of us. 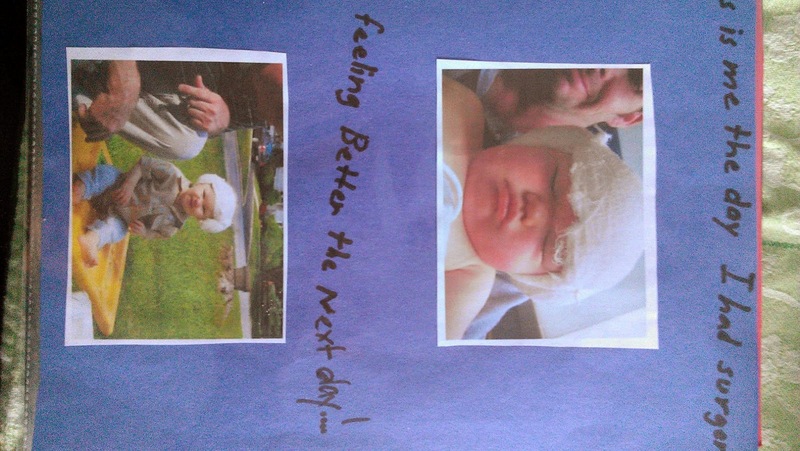 The blog morphed into Cormac's journey to hearing while living our crazy life. I think the blog has become more of a journal now. One of my resolutions for the new year is to update the blog more often. I want to keep as a memoir and print it for the kids when they are older. They will have their own book of their life. I still want to make sure we follow Cormac's journey through life as a deaf kid with cochlear implants. Sometimes I don't know what to write about him because our lives are just so normal in regards to Cormac. Trust me, the amazement never wears off. Daily I am reminded my totally deaf son hears and speaks and listens and plays basketball and soccer and baseball and does gymnastics. We have moments when things would be easier if he didn't have cochlear implants but really they are just small things. Making sure we have tape to secure his ears so they don't fly off at gymnastics or basketball. Making sure we charge his batteries. Making sure the FM is up and running daily. In the big picture these things are so minor. The important thing is CORMAC doesn't even care about any of these things. When I see him have to replace his magnets a bunch of times because they fell off while playing ball or doing gymnastics I sometimes think to myself "I wish it wasn't such a pain for him" Cormac is never upset by it. It's just part of who he is and what he does. He has NEVER complained. Never said "ohh, these magnets keep coming off or I wish they stayed on better". Not even once has he ever complained. I am trying to get him to wear some sort of sweatband for basketball but he won't wear it. He actually refuses. I won't force him and will continue to tape them to his ears and carry extra tape if it needs to be replaced. No big deal, right? I continue to mentor and help those who are starting the journey to hearing with their children. I find it very rewarding to talk to other parents who are just starting out. It is a scary time. It is a confusing time. It is an exciting time. It is an overwhelming time. I hope by speaking with them or emailing with them I can make the journey just a little easier. Let others know just how great life will be with their little bionic baby. It might not be the journey you wanted but once you travel it you wouldn't change it for the world. So, Happy New Year!! I hope to update all the sections of the blog with updates for the New Year. Lots of changes with Calleigh too. She continues to be the walking medical mystery. We are trying out some new therapies and ideas and we will see what the new year brings! 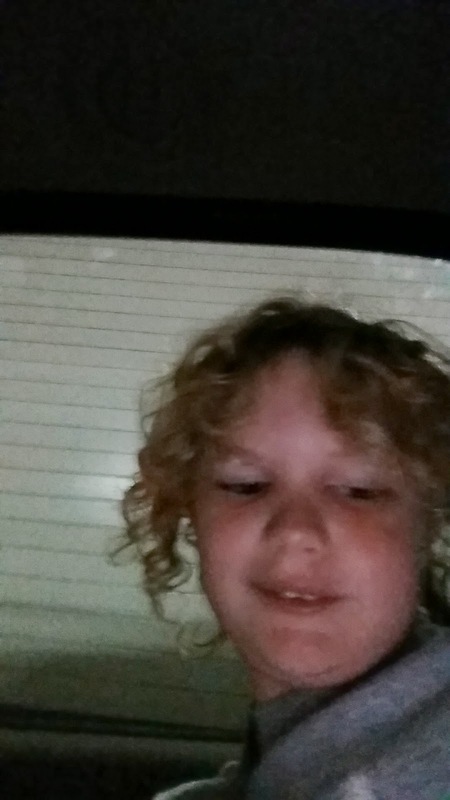 I was driving in the car with Cormac on Monday. We were off to do some grocery shopping. He is always the one who will go do errands with me. We enjoy a little alone time. I like to talk to him one on one and see how he is doing. We talk about all different things. While we were driving a song came on the radio we both liked. I turned it up and we both sang along and had some fun. While we were rocking I thought about what it might sound like to hear music through his "ears". I guess I just take for granted it must sound like what I hear because he really enjoys music. He loves to sing (and he is pretty good) and he has a good sense of rhythm. When the song was over I turned down the radio and said "Cormac, I wonder if music sounds differently to me as it does to you? I would love to be able to hear like you so I know what it is like". His response stopped me in my tracks for a moment. He said "I wish I could hear like you". 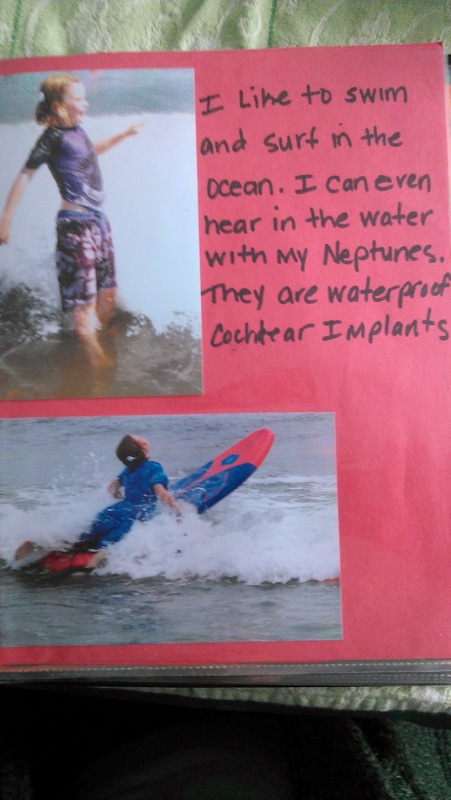 I wasn't sure if this meant he wished he didn't have cochlear implants and wished he was like me. He has never in his life ever said anything negative about his hearing. He has never asked "why me?". He has never considered himself any different than the rest of us. Was this the conversation I was dreading when he tells me he wished he wasn't born deaf and didn't have Cochlear Implants?" Keep in mind, the entire conversation I had with myself took place in about 10 seconds because I had to say something. I had to answer him. I had to dig a little deeper and see where this conversation was going. I said back to him "Do you mean you wish you could just see what it is like to hear like me or do you wish you didn't have cochlear implants and could hear like me?" He quickly responds "Oh, no, I just want to know what it is like to hear like you. I love my cochlear implants and am happy I have them. I just wanted to know what it sounds like just like you said you wanted to know what it sounds like to hear with Cochlear Implants." Whew...all that thinking I did was for nothing. The 30 second panic attack was for nothing. I shouldn't have been surprised or shocked. I know Cormac loves his implants. I know he would never change anything about himself because when it comes down to it his implants are part of him. They are all he knows. He knows nothing different. He can't remember life without them. I clearly remember the first year of him not hearing and still can cry thinking he never heard me whispering in his ear. He didn't hear my voice to comfort him in the dark. It was not upsetting for Cormac. He was a happy baby. He is a happy kid. He loves life and always has loved life. Will I someday have a conversation with him and he will feel differently? Perhaps. I guess we will cross that bridge when we get to it. For now we will continue to rock out in the car and listen to the music and not worry if it sounds different. We enjoy it all the same. Cormac can hear speech at 5-10dcb across the board. Yes, you read that correctly. I cannot detect speech at 5-10dcb across the board. Just utterly amazing! They tested both ears one at a time and of course together. I can't remember all the numbers off the top of my head but the most important one I do remember. While bilateral with noise (they introduce noise) to make it more difficult he was able to repeat sentences totaling 140 words and he only missed one! He responded to them all so quickly and was never even phased by what they were saying. I am pretty sure he scored above 95% in all of the categories. I will be waiting for the official report. Needless to say, I could not be happier with his testing results. His audiologist also did something she has never done before. They tested his hearing without his implants. Yep, headphones in his ears with tones. The reasoning behind has to do with the improvements with preserving residual hearing after surgery. She said they are testing all of their patients now. We knew he would have no results because of the amount of hearing loss he had at birth. Cormac was surprised by the testing and a little confused because he knows he can't hear without his implants. While the test was going on the audiologist kept increasing the volume. At one point I could hear it even though it was on headphones. Cormac raised his hand and said to the audiologist " I can't hear anything. I can only feel the vibrations" He said it felt strange and tickled his ears. I consider him a great reporter and he was very cooperative during testing. His results are nothing short of amazing to me. When I think back to the beginning and learning about Cochlear Implants for the first time I never thought in a million years results like this were possible. I knew he would have access to sound. I saw other children talking with their implants. To sit in the booth with him and watch him whiz through testing with ease is just unbelievable. Sure, he doesn't hear like you and I hear but looking at him it doesn't appear that way. On our way into NYC Cormac was playing with Google Translate on my phone. He was using it to translate English to French. He sat in the truck talking into the phone, listening to the response and repeating it for me to hear. Granted lots of his statements were silly words and sentences but he was learning French. When we got home he happily shared his new words with his brothers. They can all say "Dad blew up the toilet" and "My brothers exploded the bathroom" in French. Hey, as long as they are learning another language....I will take it, right? Here he is in the waiting room. I remember him being so tiny in the chairs. Now he is outgrowing them. It's been quite a while since I updated. There are a few reasons. One my laptop has been on the demise and sometimes it's not worth turning it on. I have to get a new computer. Secondly, since school has ended we have been really enjoying our Summer. We decided to not send Calleigh to her Summer program this Summer. I think we all needed a break. She has been enjoying her Summer like any other kid and she is thrilled. She continues to get her private physical, occupational and speech therapy. We had her testing done for her heart surgery. We haven't met with the surgeon yet to review her results so we still don't know which surgery she will need. There are two options. She can either have the surgery performed via a cath inserted through her groin. They will use an umbrella like device that opens up and would cover the hole in her heart. This is the option we are hoping she can receive. If she isn't a candidate for the cath she will have to have open heart. And well, you can just imagine why we are hoping for option one. The boys continue to grow up faster than I would like them to. Three eight year old boys are tons of fun. To say they are enjoying their Summer is an understatement. We have spent the Summer making memories I know will last a lifetime. Movies on the beach, fireworks on the beach, great times with friends, riding bikes, surfing, swimming, playing and just being kids. Cormac has mastered putting on his Neptunes alone which is a huge help. He can even change the batteries without my assistance. I feel like this Summer is just a perfect time. No commitments in the mornings. No school pick up or drop off. Not a lot of strucure which really works for us right now. Calleigh is so much calmer and happier. The stress of school makes the start of each day so upsetting. I think she truly knows she isn't going and is a happy little girl. I am dreading the return to school for her. Water and the beach seem to be her happy places so it really works out we live at the beach. Her swimming lessons are going well too. She loves the pool. We are plugging away at the boys wish list for Summer. They had about 20 things they wanted to do. Hoping we can accomplish all of them before school starts. Sometimes I wonder about writing the blog. Sometimes I wonder about Facebook. I out a lot out there. This blog started to help others be aware of Cormac's hearing loss and journey to sound. 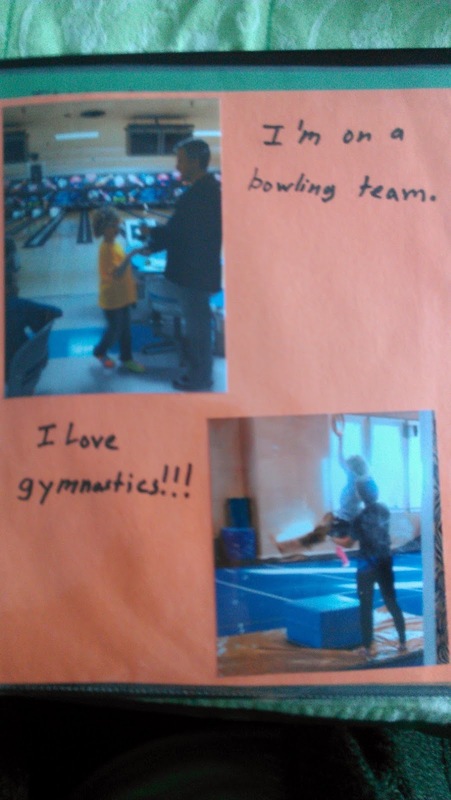 I continued to write it because I became a mentor for Advanced Bionics and parents were referred to it. Lots of those same people are now friends on Facebook. I don't always know who is reading or if it helps anyone. I learned over the weekend from two different people how much they appreciated being able to share our journey because it made their journey a little easier. I learned a sick young lady found so much joy is following my families crazy antics. Makes it all so worth while. I am not sure why this has been on my mind lately but it has me wondering if perhaps I am the exception to the rule. When I think about Cormac and Ciaran and their hearing loss I am 100% ok with it. I honestly never have a day when I think any differently. I never wish Cormac wasn't deaf or Ciaran didn't have hearing aides. It is who they are and I think it would change who they are if I removed their hearing loss. Perhaps it has a lot to do with how fine they are with themselves. They take pride in who they are as individuals. They proudly rock neon earmolds or attach Mine Craft accessories to their devices. Maybe it is because we have had nothing but positive experiences. Maybe it's because I don't perceive them as any different than Colin. If I was granted three wishes form a genie I can tell you I would not wish for Cormac to hear or Ciaran to not need hearing aides. I sometimes think maybe I should want it to be different. Does it make me seem less caring than others? Do people think I might love them less because I would not change anything? Would a better parent want to take this away from their child? If you know me you know I love my kids to death. I have fought for them since the beginning. I love them no matter what. I would NEVER want their lives to be harder than anyone else. I would NEVER want hem to be unhappy. I would never want to see them struggle. I want their lives to be filled with only love and happiness. I think as their Mom I am doing my best to give them all the love and happiness they deserve. What I see every day are happy, healthy, well adjusted kids. I see just turned eight year olds. I see no limits to their futures. I listen to my deaf son sing all day long. I listen to the boys talk and talk and talk ALL DAY LONG!! Sometimes I think I think the talk too much :) I watch then run into school because they love it. I watch them on the playground or baseball field or soccer field or at gymnastics and not once does it cross my mind that it should be any different. I do still find myself in awe of them. I think about how I would have felt as a child and be "different". I don't think I was as confident as Ciaran and Cormac. I love that just this morning Cormac said to me "Mom, last night at baseball Joe told me I was very cool". I said "why did he say that?" 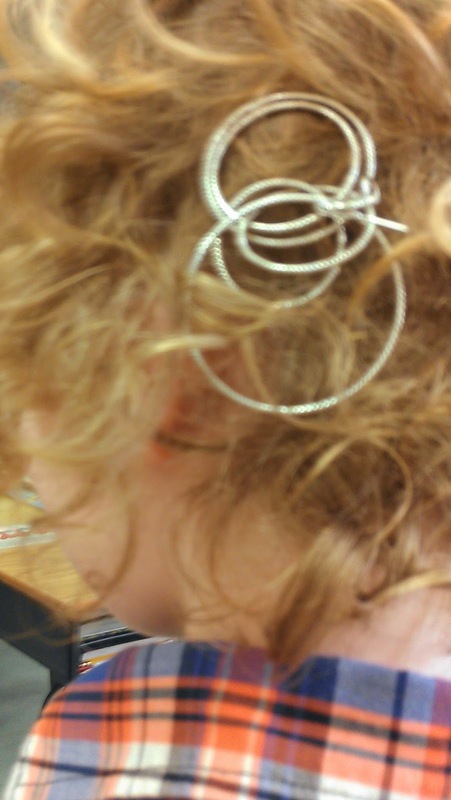 Cormac says because he said to me I know you wear those to help you hear but how do they stick to your head?" 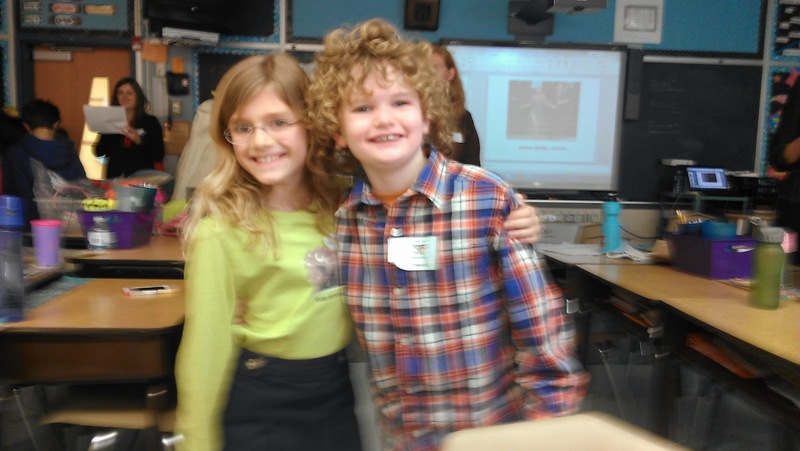 When Cormac told him and showed him the magnets the boy said it's totally cool you can do that"
Cormac and I were asked to participate in Different Learner's Day at a school in Little Silver, NJ. We participated last year and Cormac was so excited to be asked to return. The school does an amazing job for this special day. The point of the day is to let kids know everyone learns differently and while you may learn differently everyone is the same. There was a hearing room, a vision room, a physical disabilities room, etc. We were obviously in the hearing room. An audiologist, Lori, ran the room and did a spectacular job. She talked to the kids and taught them about hearing loss. The kids broke up into groups and went to different stations. They had a sign language station, an unfair hearing test station and our cochlear implant station. Cormac was the only child who participated in any of the classrooms. 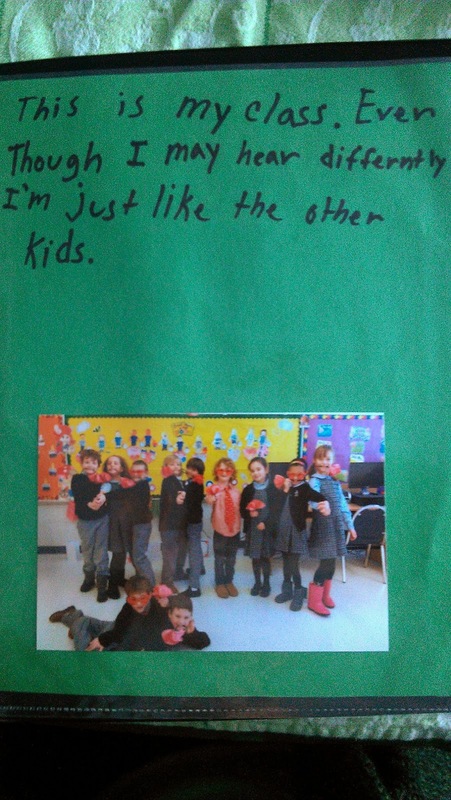 Cormac prepared on his own and made a binder about himself. I was so proud of him. What I loved most was the last page. He said "even though I may hear differently I am just like all the other kids" Isn't that what we want all our kids to know? He said at one point "My friends at school don't care I have implants. They just treat me like everyone else. 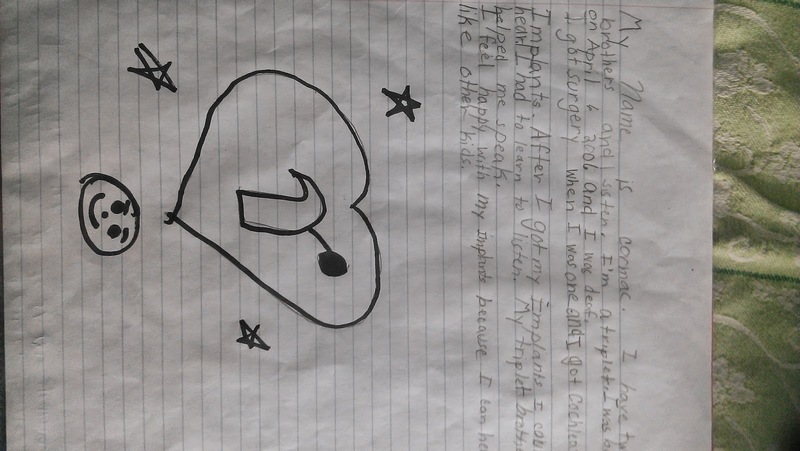 But if I don't hear something they help me too"
Here are pictures from his binder. Sorry about the first two facing the wrong way. In total he spoke to about 80 third graders. They came in small groups so it wasn't all at once. He was never once afraid to talk or shy. He was proud of himself. He was proud to share his experiences. He was thrilled to answer questions. He was comfortable in front of the kids just being him. He was funny and loved showing the kids he can stick metal objects to his head. He loved showing them he can read lips. Here he is with my earring stuck to his head. Here is a group of the kids. I had two favorite moments of the day. The first was when the boy in the video says "He talks better than most of my friends". Some of the kids were really surprised he could talk. Lots of them asked their questions to me instead until they realized he just answered them anyway. The second favorite moment came via a sweet little girl named Sophia. After Cormac did his presentation we asked if their were any questions. To which she replied "I don't have a question about his hearing but how did you get to be so adorable.?" Cormac turned every shade of red under the sun. She was so adorable. As she was leaving the class. She stuck her head back in the doorway and said "Cormac, I just can't stand you cuteness!" We managed to get a picture with her. And this was his reaction when she called back to him in the room. He was being shy. I don't think I stopped smiling the entire day. I had flash backs to sitting in a rocking chair and crying when I was told Cormac was deaf. I rocked him and thought so many things. Would he be able to go to school with his brothers? Would he speak? Would he every hear me say I loved him? Would he ever tell me he loved me? So many thoughts ran through my head that day and in the many days to come. If someone told me that day I would someday watch my deaf son speak and talk about himself with such ease and confidence I probably wouldn't have believed them. 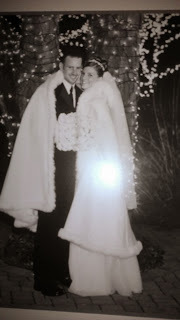 My heart was filled with love for him and for all the people who helped us reach this point. It takes a village for sure. I did shed a tear when he said his brothers helped him learn to speak. He credits them with getting him talking. Here are some videos of him speaking to the kids. Today is Cochlear Implant awareness day. I am thrilled a day s set aside to recognize this medical miracle. On a daily basis in a normal day in our lives we have reached the point where it is just "normal". Cormac is just a typical almost 8 year old. While it seems just like any other part of our day not one single day goes by that I am not aware of many things. I am aware Cormac can hear. Yep, he hears. My deaf kid hears. I am aware he is and has been for years above age level in school. I am aware he was fully reading by the age of four. I am aware his cochlear implants have made it possible for everyone in our family or everyone we know to communicate with him without my assistance. I am aware he loves music. I am aware he loves to talk and tell stories. I am aware he no longer is a spectator in his own life with his brothers and he is part of the team. I am aware he loves to goes to school every day and thrives! I am aware of how hard he has worked to get to where he is today. I am aware he makes it look easy when I know he has to work harder than other kids to appear the "typical" kid. I am aware he loves his cochlear implants. I am aware he knows he is deaf but it does not define him. I am aware making the decision to have him implanted was the single best decision I have ever made in my life. I am aware anything is possible for him and he has NO LIMITS. I am aware of how amazing Ciaran and Colin have been in the entire process. They are his best supporters and biggest helpers. I am aware Cormac is surrounded by children all day who love him. His classmates are just amazing and he is blessed to have them. But what I am mostly aware of is even though we are over six years in Cormac's journey not a single day goes by when I am not stopped in my tracks by something just amazing. He says something or does something and marvel at it. I am aware the miracle of cochlear implants never, ever gets old! Ten years ago today Frank and I got married! It seems like yesterday and a lifetime ago at the same time. I remember the day vividly. I was so happy. I refused to let anything upset me on such a special day. What I remember from that day is fun, family and knowing it was forever. The past ten years are filled with so many memories. From the first day we met (that was 15 years ago) to the day her proposed at Yankee Stadium to the day we walked down the aisle. We have had lots of firsts together. First home, first dog, first, well, first three babies. We have been truly blessed to find each other and have the opportunity to create such memories. Are there days when I might want to kill him? You bet. Are there days where I might totally drive him nuts? Yup. But what I know is at the end of each day there is no one else I want to be next to. We have been through a lot in 10 years. Marriage itself isn't easy. It takes work and effort. When you add on some special circumstances, well it can sometimes be a recipe for disaster. For us, that has not been the case. We have met our challenges head on and never ever questioned the reason behind them. We make a great team because we approach things very differently. We balance each other out when we have to face a challenge. I still think he is funny. I still thinks he suffers from OCD and won't admit it. I still think he's handsome. I still enjoy spending time with him. I still look forward to him coming home at the end of the day. So, it hasn't been all easy and all fun and games but the good days outnumber the not so days and I know even on the not so good days there is no one else I would rather be spending the day with. 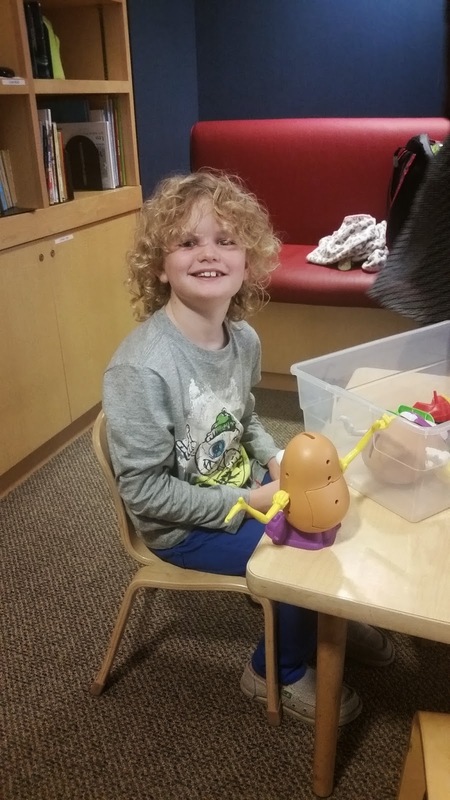 Since Cormac was diagnosed we have never treated him differently than any other child. We have never put limitations on what he can do. He has never put limits on himself. He sees himself as just another kid. The only time I ever saw him act differently or not be himself was when we played basketball for the first time. That was two years ago. He was five. He eagerly signed up but at the first practice I could tell it wasn't going well. When he started it was just drills. They didn't play games. It was lots of instruction. The only time he seemed to be enjoying himself was during the time they played dribble tag. The acoustics in a gymnasium are terrible. I could tell he was having a hard time hearing. He seemed to be following others rather than listening. He was out of his element because he is used to hearing and not just following everyone. As the weeks went by that first year he didn't want to participate until they were doing the tag part. He didn't have to listen to play dribble tag. He knew what to do. We started using the FM the next week but I think he just got off to a bad start and said he didn't want to play. I didn't want to force the issue but I didn't want him to give up either. Each week we went it was sort of a negotiation. He would never come out and say he didn't want to play because he couldn't hear well. It made me sad. Last year he said he didn't want to play. I told him he didn't have to play. When we got there I could tell he wanted to play deep down. I think he was nervous he would miss something and not know what was going on. He went on the court a few times. Again, it was just skills last year. Now we are on year three. It's different this year. They have practices and games. No more just drills. I thought for sure he would not want to play. He said he didn't. I didn't sign him up this year. I felt terrible he was not playing because he couldn't hear well. This was a first time I had to handle him being stopped by his hearing. We have never been limited by Cormac's hearing loss. I guess in my head I just hoped things would always be the same. In the back of my mind I knew there was a possibility something would come up at some point in his life but I guess I was sort of in denial. I didn't want to force him to play and make him feel worse but I didn't want him to not play if her really liked it. We talked about it before the first practice. 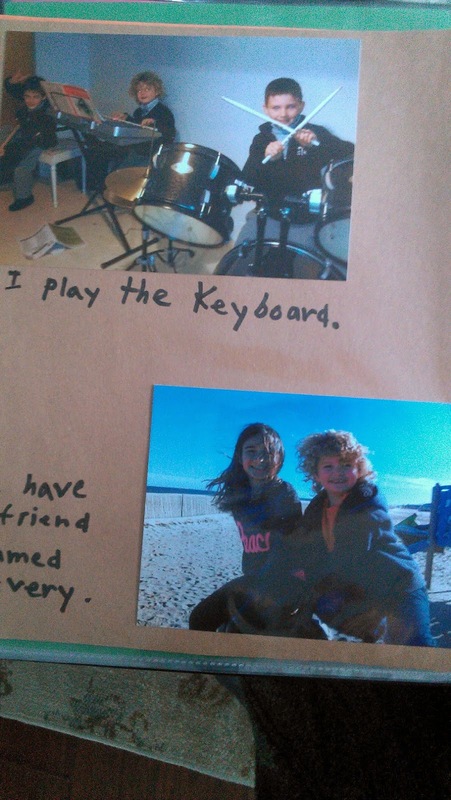 We talked about how it was OK to not play if it was hard for him to hear. We talked about using the FM like we did last year. I couldn't go to the first practice. He went with Frank. 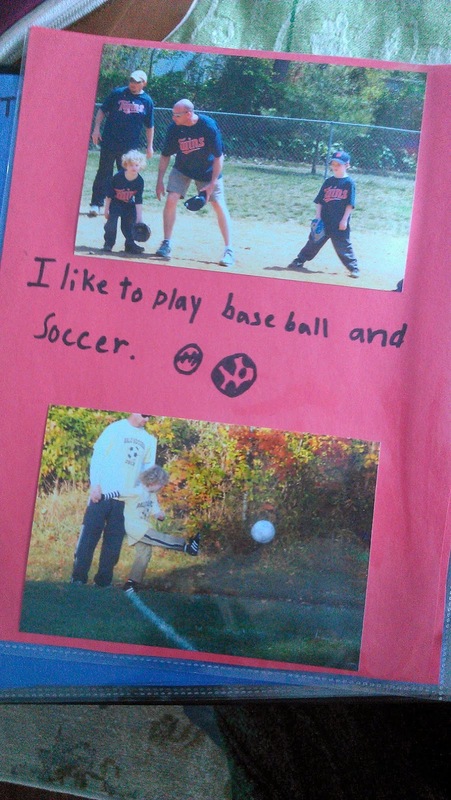 He went to the first practice when they would let everyone play and pick teams. He came running in the house and said "I love basketball. It's so much fun. Thanks for letting me try it again!!" I was like "what???" (in my head of course) I couldn't believe what I was hearing. If you knew what it was like before you would be amazed. He didn't even have them FM with him. He has now been assigned to a team. He went to his first official team practice last night. HE LOVED IT! I am not sure what has really changed. The acoustics did not get any better in the gymnasium. I am thinking it is Cormac that has changed. He is getting older and more mature. 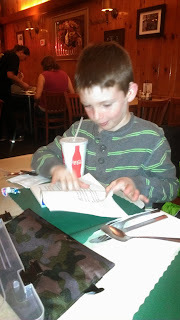 He has better coping skills and his self advocacy skills are better than you would expect from a 7 year old. I think this all is part of the reason he loved it. He isn't afraid to speak up and ask for things to be repeated. He is surrounded by kids and parents who know and love him. They all might not quite understand why it's difficult for him but they are supportive of him. Whatever the reason or combination of reasons has gave him the confidence to play basketball I will take it! Cormac continues to have no limitations. He continues to live his life as a typical 7 year old. He continues to amaze us with his ability to be just like other kids in so many ways but in so many ways he is not a typical 7 year old. Cormac is an old soul and wise beyond his years. I continue to be impressed with what is possible for not only Cormac but for all the people who have cochlear implants. I say it all the time but IT NEVER GETS OLD!!! Cormac: He just rattled them off and I typed them as he said them. 1. I am thankful for my dog. 2. I am thankful for my sister. 3. I am thankful for my Mom and Dad. 4. I am thankful for my brothers. 5. I am thankful for my house. 6. I am thankful for the beach. 7. I am thankful for food on the table. 8. I am thankful for playing dress up with my sister. 9. I am thankful for Meema, Grandma, Pop Pop and Grandpa. 10. I am thankful for my cochlear implants. 2. I am thankful for Duke, Raven and Duchess. 3. I am thankful for my brothers. 4. I am thankful for my Mom and Dad. 5. I am thankful for my Meema, Pop Pop, Grandma and Aunt Mary. 6. I am thankful for my guitars. 2. I am thankful for Raven, my brothers and sister. 3. I am thankful for my food. 4. I am thankful for my toys. 5. I am thankful we have enough money. 6. I am thankful we have cousins. I did my 30 days of thanks on Facebook so I won't bore you with what I am thankful for again. Take some time to really think about what you are thankful for in your life. Others might have more than our family in material items but we are rich in love and appreciation for each other. To me, those are more important. My hope is to raise children who are thankful for even the smallest things in their lives. Hope you and your families have a wonderful Thanksgiving! I read this article the other day. It was titled 10 Things I Learned When I Stopped Yelling at My Kids. I admit I do yell at my kids sometimes. There are times I feel it's the only way to get there attention over all the noise! I really try not to yell but none of us are perfect, right? When I do get upset I go to bed the same way she describes. I feel like I failed for the day. I feel like I need to do better. By yelling you might miss out on life-changing moments. The boys were up in bed and Ciaran came downstairs. Normally, I would have said "Go back to bed. You know you are supposed to be asleep." Ciaran is known for his stall tactics at bedtime. Tonight, I didn't tell him to go back to bed. I simply asked him what he wanted. And you know what he said? "Mom, you know that book I am reading? (He started a book yesterday and is super interested in it. He even brought it out to dinner and read it in a restaurant tonight) Can you please find me more books like that? If I had books like that I would read them all the time" I nearly cried. I leaned down and kissed him and told him I was so proud of him. I told him when he went to sleep I would look up the author on the computer and find him more books! He went right upstairs and went to bed. I would have missed that moment if I had just responded with my normal "Go back to bed"
Honestly. I have been trying forever to get that boy to enjoy reading. He always says he doesn't like to read. Reading didn't come easy for Ciaran. He had to work a lot harder than Cormac and Colin to learn to read. He compared himself to his brothers and when he realized he wasn't reading like them it was difficult for him to enjoy it. When I go to bed tonight I will rest easy knowing I truly listened to something very important Ciaran had to tell me. I am glad I didn't think it was his usual delay of game. I already looked up the author and found seller on Ebay selling a collection of his books! I can't wait until they arrive! Here he is drinking chocolate milk and reading his book at the restaurant. I cannot tell you how many times people have told me everything happens for a reason. Sometimes we have to wait for the reason for a long time. This statement seems to boggle my mind because when certain things happen you wonder what could possibly be the reason. It's when you have to rely on God to show you what the reason could be. Last week I went to the Garden State Walk for Hearing. I volunteered at the Advanced Bionics table. On our car ride there I had a moment. A moment when the normalcy of our lives brings me to tears. After all isn't that what we all want for families? The boys were in the truck having a conversation. I had the radio on. Adele came on the radio and it was "Rolling in the Deep". It is one of Cormac's favorite songs. When I hear it I automatically smile because I know how he loves it. I glanced into the backseat and there he was tapping his foot to the beat. Singing all the words all while making a teardrop bracelet on the rainbow loom. I cried. In that exact moment I felt pure joy. I thought "Good gosh, look at him." He didn't appear to be putting an extra effort into doing anything. He was just a kid doing what he loves to do! I am not sure why it made me cry but certain things just hit you. I had an amazing day at the walk. I had a day where perhaps I learned a reason. When we arrived at Garden State Walk for Hearing I felt like I was at home. I was in my element. I was surrounded by people who understood me. People who got me. They have walked in my shoes or are following in our footsteps. They are following in Cormac's footsteps. And those are some pretty freakin amazing footsteps. I know I am his Mother but I have to admit he is an unbelievable child. I had a parent tell me when she met Cormac for the first time and her daughter was just a baby it was the moment she knew her daughter would be OK and would get a cochlear implant. I had another Mom so happy to see Cormac and let him meet her family so they knew what their son's future would be. All of this from Cormac. One little seven year old. One little boy who came into this world in total silence. For one entire year his world was quiet. His world was quiet but his personality was never quiet. He was always the happiest baby and always smiling. To think, he didn't hear ANYTHING...not even my voice to soothe him if he was upset or me telling him I love him devastated me. He on the other hand doesn't remember not hearing. When I tell him he didn't hear he finds it hard to believe. He has no memory of not hearing. (Well, if he did remember it would be a miracle considering he was one when he was implants LOL). One little boy who opened our world to a world we knew nothing about. Today, I was surrounded by people who we have met along our journey. People I know and love. People I NEVER would have known if not for Cormac. Today we saw friends whose children started this journey with us and are just as inspirational as Cormac. Children who had now words when they first met and now never stop talking! We saw teachers who work tirelessly to give our children their voices. People who gave Frank and I the resources and support we needed to travel this path. We saw little ones who are in the beginning of their journey and there it is. The reason. Cormac is the reason. Cormac was born to give Hope to others. I honestly believe Cormac was put on this earth to inspire others. To lead through example. To just be Cormac. And just being Cormac is more than I could ever ask for. Another friend asked me if he knows how influential he is when parents meet him. I said he doesn't. He is just being him. His enthusiasm and love of life speaks for itself. I attended his parent teacher conference this week as well. As expected he is doing great in school but here is a direct quote from his teacher "He loves to answer questions. He is the first to raise his hand. He is the first to volunteer to READ OUT LOUD to the class. 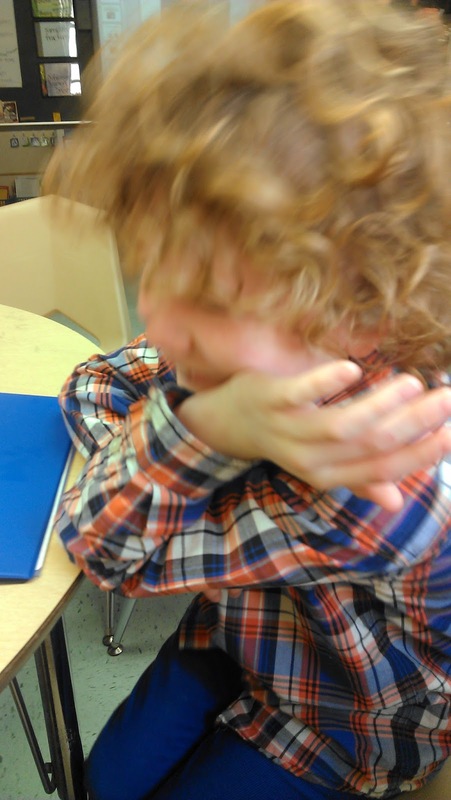 He asks questions when he doesn't understand and he asks for things to be repeated if he doesn't hear it" I am pretty sure this is the dream of any deaf child to get this report from the teacher. He is reading, he is speaking outloud and advocating for himself when he doesn't hear! So, all those years ago when I didn't understand it. I think I see it clearly now. Cormac's reason or purpose was to inspire and help others who are travelling the same road. He was put on this earth to give hope to other parents who are terrified when they find out their child is deaf. When they have no clue what to do and question every single aspect of their child's future. He is here to ease those fears and show everyone how just perfectly normal life will be for them. I could not be happier for him and I am truly, truly blessed to be able to be his Mom and witness his purpose. What might go down as the longest 48 hours of my life started pretty normal. I kept Calleigh home from school on Thursday. She had a runny nose and was sneezing. Pretty normal. Thursday night before bed she seemed to be getting a cough so I decided I would keep her home the next day. I had an appointment Friday morning to get a root canal. After returning from my root canal I noticed Calleigh seemed to be working hard to breathe. Her chest was retracting a lot and she appeared to look a little blue around her lips. I called her pediatrician and was told to bring her over now. Keep in mind at this point she was in the happiest mood. Running around, playing, laughing. Having a great time. I kind of have a sixth sense when it comes to Calleigh. It's just a feeling I get. It is NEVER wrong. As I put her in her car seat for the ride to the pediatrician's office I lowered the rearview mirror so I could see her on the ride. In my head I kept thinking. "If she stops breathing is it faster to pull over and call 911 or is it faster to get to the doctor" (we live pretty close to their doctor). Most people wouldn't have these thoughts but Calleigh has scared us before. I just kept praying we would make it to the doctor. She was still laughing and talking in the car but I had this feeling. We got to the pediatrician's office and they took her right away. They put the pulse oximeter on her and the nurse and doctor kind of looked at each other. They said we need to do that again. Calleigh is NOT a cooperative patient. At all. She freaks out like you have never seen a child freak out. They tested her two more times and the doctor says to me "If this reading is accurate she needs to go to the ER." I think, OK, I will get my stuff together. She says no, "I need to call 911 to get her transported. Her levels were about 82". I know normal is 100. 95 is OK. 82?? I was wondering how she was still awake and alert. I saw one of the measurements and it was 79. A few minutes later we were in an ambulance being transported to the hospital with Calleigh receiving Oxygen. It was not a "oh, she needs to go to the hospital ride, It was she is in bad shape ride. We had two ambulances going full speed. Light and sirens. I had already called Frank from the doctor's office and he was on his way. My Mom was on her way down because I knew I would need someone to pick up the boys at school. Her Oxygen level was still dangerously low. Frank arrived after apparently after the fastest ride ever down the turnpike and the parkway. They ran some bloodwork, did chest x-ray and examined her. Her chest x-ray showed the very beginnings of pneumonia. This was not enough cause such labored breathing. They said she also had some viral infection along with a double ear infection. Keep in mind this kid had NO FEVER on Thursday before bed. She was in the happiest mood and more than normal except for a runny nose and a slight cough. By Saturday morning Frank came back to the hospital and the boys were allowed to visit too! This made her so happy. I left the hospital for an hour and went to the dentist to try and get some relief. I wound up getting antibiotics and a pain killer. Sounded like a plan. While I was gone the doctor came and rounded. He said she had to stay another day because she was still requiring some oxygen that day. We took her off Oxygen after he left to see how she could maintain her numbers. At this point she had four doses of really strong anitbiotics. As her infection cleared she would be able to breathe easier. I got the first relief I had in nearly 24 hours after taking the pain killer. Advil and Aleeve were doing nothing. I thought it was great. Little did I know I would get horribly sick from taking them. I took them every few hours on Saturday and by Sunday morning I was vomiting. (at the hospital, on the car ride home, and pretty much the rest of the day) I know now I could NEVER be addicted to pain pills. It was probably because I wasn't eating much while I was taking them but I was stuck in the bed with Calleigh because she didn't want me to leave her. On Sunday, they said she could come home. I was puking at this point. We got home Sunday and I was good for nothing. I passed out in bed from not sleeping for two nights and got up to be sick a few times. Calleigh on the other hand was doing great and playing at home. This morning I am better. Calleigh is coming along. It might have been the longest 48+ hours ever. She is such a trooper. It terrifies me how quickly things go bad with her. I don't know why it happens to her. She gained a reputation quickly at the hospital for being "much stronger than she looks". It took 4 nurses and me to hold her to draw her blood. The big burly paramedic on the ambulance was no match for her. The police officer who first responded to the doctor's office who was at least 6 feet 3 decided to take his report from the hallway and not even go near her! I told them she may be small but she is MIGHTY! Thank you to everyone for all the well wishes and prayers. We appreciate every single one of them. To my sweet friends who dropped off food for us you have no idea how much I appreciate it. It was such a relief to not have to worry about dinner last night or for tonight and possibly tomorrow too! It gives me time to focus on Calleigh and the boys. My boys are such good kids. They put up a brave front but I know them too well. I could hear their voices on the phone and knew they were worried. Ciaran was so afraid. I could just tell. His little voice quivering on the phone while I talked to him. It breaks my heart. They were so excited to see her on Saturday and brought her all her favorite toys from home. So we are home and she is on the mend. Let's hope it stays that way. We could all use a little rest! That is how I sold the first day of school to Colin. He was by FAR the one who didn't want to go back. He was sad and mad and kept saying "Summer went to fast". Last night I kept thinking there had to be a way to get him excited about school. Somehow, someway, right?? So, I had him sit on my lap and cuddle with me. I told him how 2nd grade was going to be an adventure. He replied "No, school is not an adventure". I said "Sure it is. An adventure is an unusual or exciting experience. It's something you have never done before. You have NEVER been to 2nd grade. You have never been in Mrs. Albietz's class. You have never been in class with the same exact kids you have in your class. You didn't get to make your Holy Communion before. You will learn to write cursive." I was pulling out all the stops. He didn't seem quite convinced last night but I got a few smiles out of him. I was pleased. Maybe I made some progress and convinced him. Calleigh and I went to pick them up from school. They all came running out so excited to see me and Calleigh. The FIRST words out of Coln's mouth "Mom, it really was an adventure! 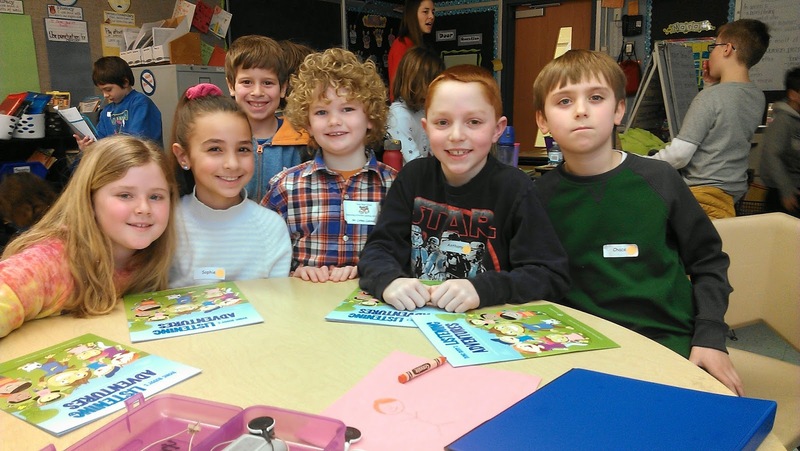 I loved the first say of school and Mrs. Albeitz is soooo nice." SUCCESS!!!! It worked. I was so happy he had a great day. I have so much to update about the end of Summer and the start of school but it seems I don't have a second to myself. When we are talking about Calleigh nothing has ever been simple. Not one thing has ever been easy or has gone smoothly. It's just how it is. So when I started thinking about taking her out of her crib I would get overwhelmed with just the thought. She loves her crib. She stays in her crib. She can be put in there at any moment and she never asks to come out. Why mess with this? Would she ever sleep again? Would she be running out of the room every second. I honestly just didn't have the energy to take on this process. Simple as that. Then we found this awesome bedroom set at a price I couldn't pass up. I had it delivered and made them leave it in the middle of my dining/living room so I would be FORCED to refinish it in a timely manner. I was able to complete the set in a few days and am very proud of my work. But when I finished it I realized I HAD to put her in the bed....there was no turning back. I was not looking forward to it as all. Of course the night I chose Frank didn't come home from work and stayed at my Mom's house but I did it anyway. 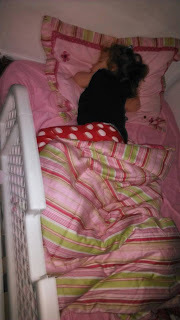 I had been talking up her "big girl bed" for a few days. Every time I mentioned it I said "big girls have to stay in their bed. They are not allowed to get out unless Mommy or Daddy come and get you". She would say "ok" but I wasn't really convinced. The first night I put her in the bed she got out twice within about five minutes. I went in and told her if she got out again she would have to give up her big girl bed and go back in her crib (or cribby as she calls it). She never got out again. Not that night. Not the next morning! She waited for me to come and get her. She has now done this four days in a row. I thought it was a fluke but it seems it is not a fluke. She seriously LOVES her bed. She waits each morning for me to get her. Could we actually done one transition smoothly??? Is it possible? I think we might have. I think she is finally old enough to understand it. Keep in mind even though Calleigh is four she does not act like a four year old emotionally or socially. She catches up a little more each day but she is still delayed. I am in love with her new room. I am in love the expression on her face when I go in her room in the morning as see her. She is sitting up playing with her toys. It seems like the first thing we have tried with her that has gone as planned! I love being able to lay with her at night and read her a book. I love how I can turn off her light and walk out and she is happy and just goes to sleep. Transitioning the boys wasn't as simple. Three boys in one room at the same time I didn't really expect them to just lay down and go to sleep. Really, does anyone think they wouldn't be partying when we left? 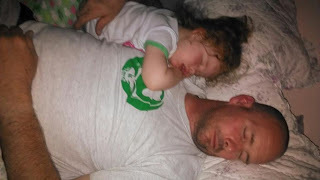 We always laid down with them for a while and usually one or two fell asleep and we could leave them for the night. Frank normally does the night time routine with the boys. They look forward to it and continue to do it each night. HE sometimes goes in their room and we don't see him again for hours because he falls asleep before them. Her room isn't finished because I am changing her bedding. She will have a mermaid room. Her new bedding came but I still have to make her curtains. I will post pictures when it is all complete. Here are a few pictures of her in her new bed. First night and all is well. Second Night went just fine too! I could honestly just watch her all night. I know it's crazy but she just seems so peaceful. I can't help but sneak in every night to take a few pictures. I think she is getting better sleep as well. She started to look so big in her crib now she looks so tiny again in a big bed. This Article was popping up all over the place yesterday. I read it and thought it was such a great article and so true for so many families. The sweet spot of parenting. It's a time parents are thrilled to be part of but at the same time makes you a bit sad because you know it's also a time that goes by too quickly. It reminds us to take the time to really enjoy all the moments. It also made me think of The Sweet Spot along our journey to hearing for Cormac. This sweet spot however, comes with not a bit of sadness. It comes with a sense of accomplishment. It comes with a sense of awe. It brings tears to your eyes. These tears are not tears of sadness. Those tears are long in the past. It's the moment when you realized. Everything is Ok. I can remember another parent telling me about 2 to 3 years after implantation life will all of a sudden not be solely focused on helping your child to learn to listen and speak. Your life will suddenly just be your life. At the time it seemed unimaginable. I remember the EXACT moment we reached the sweet spot along our journey. It's a day I will never forget. The memory is so clear it's like it was yesterday. I have to give a little history on how we arrived at this day. 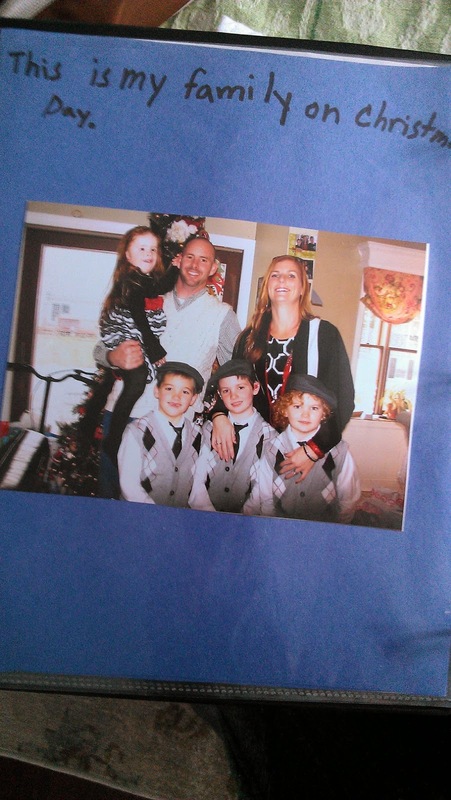 We decided early on we wanted Cormac to attend mainstream preschool along with his brothers. It was a goal I would meet. Failure was not an option. We did everything within our power to get him prepared for this moment. The way it works Cormac received early intervention until the age of three. At three he is released and would go to mainstream preschool. There was only one issue. He turned three in April and his preschool didn't start until September. 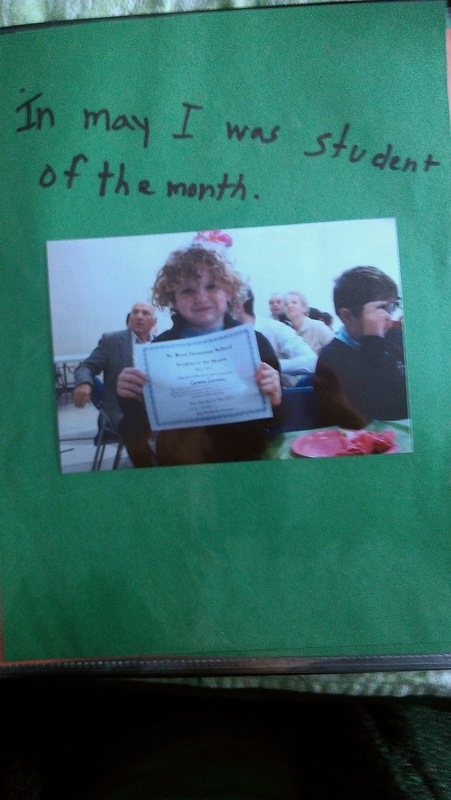 I didn't want him to not receive any services for such a long span so I decided to put him in Summit Speech School in their morning program from April until June. He would have a few weeks off in the Summer. On his first day of driving him (I was about 6 months pregnant ) he was sitting in the third row of our Suburban. I was driving and had so many thoughts going through my head. Was I making the right decision? Was this the best plan for him? Is he ready for mainstream preschool in the Fall or should I have made him enroll in Summit for the year? The thought of him being apart from his brothers literally broke my heart. As all these things were going through my mind from way in the back of the truck I hear him say "Mom, do you see that contrail coming out of that airplane flying in the sky?" (Keep in mind it was the day after his third birthday and he had NEVER HEARD a sound until he was 13 months old) I look out the window and see it. I start to cry while I am driving (and as I type this I can't help but cry at the memory) I tell him in a very shaky voice. "Yes, I see it" And he knows I am crying and he says "Mommy, don't worry I am going to be just fine". I said back "I know, Cormac. You will be OK"
That was our sweet spot moment along the road to hearing. It's one of the greatest memories I have of Cormac. He was so small and so young. Somehow in his mind he just knew I was worried. He knew just what to say and when to say it. It's not to say I don't think or worry about it any longer but for the most part it's just a part of who he is and it by no means defines him. 1.Frank and I are apparently very good in an emergency. 2. EMT's and police respond quickly to 911 calls and are amazing. 3. Our boys can sleep through anything. Including two or three cop cars along with an ambulance. I think at one point there were 6 cops and 4 EMT's in the house. They didn't even come out of their room and we had to tell them about it this morning. Calleigh went to school yesterday with what we thought were allergies. Sneezing and a slight cough but not a cough in her lungs. More of what seems like a tickle. The school nurse called and said the teacher sent her to get checked because she was coughing more. She did not have a fever and they didn't think I needed to come and get her but wanted to give me a heads up. I went and got her anyway. She really seemed OK all day. No fever. We went up to the beach for a while. She played in the sand and had lunch. She seemed totally fine. By dinner time she still had no fever and at like her normal (and when I say normal I mean she eats like a grown man) self. After dinner she seemed to feel a little warm to me. I took her temperature and it was 100.3. No big deal. Slight fever. We gave her Tylenol and it was time for bed. For some strange reason I told Frank to let her sleep in our bed. (She never sleeps with us. Always in her crib.) Not sure why I felt the need to keep her with us. Frank actually fell asleep with her and I took this adorable picture of the two of them around 8:30. Around 9:30 Frank woke up and had a snack and when he went back into the room all I heard was "Calleigh are you ok? Calleigh wake up!" He came out of the room holding her. Her body was limp but twitching and her face was very blue. I took her from him while Grandma called 911. She was unresponsive and still slightly twitching. I gave her a few rescue breaths and she coughed. She still was out of it but she was breathing. The Police and EMT's were here in what seemed like seconds to me. They were very fast. We had her on the couch and they were trying to wake her. At this point she was no longer twitching or seizing but totally out of it. She opened her eyes a few times and seemed to know who Frank and I were which was reassuring. They did give her some Oxygen. By the time we were ready to move her she was still out of it but we were able to carry her to the ambulance and hold her on the ride. She slept or was out of it for most of the ride. She did lift her head up a few times looking around. Each time the siren went off she got a little frightened and would loop up. She had not said anything yet at this point. When we arrived at the hospital she was coming around a bit. They took her temperature and it was 103.9. Keep in mind she had already had Tylenol less than two hours before this. So her temperature spiked pretty quickly which can cause Febrile seizures. She was given motrin and as it started to work she was coming back to us. She started singing "Somewhere Over the Rainbow". She would answer questions if asked. She would fall asleep in a second. But it was late at night and her brain had just been firing on overdrive so it is to be expected. About an hour later she was charming the nurses and doctors who all agreed they wanted to take her home with them. Our doctor who was awesome and actually sang the them song to "Team Umizoomi" to her so she could examine her. She also said she had twin boys at home and if Calleigh needed a prom date she would be more than happy to volunteer one of her boys. She sang for them and was smiling and laughing. I am pretty sure she was delirious from lack of sleep and the seizure. She was a happy camper. We finally got home around 2am. She slept in bed with us. I should say she slept while Frank and I sorta stared at her all night. Its hard to sleep knowing it might happen again. Her fever has remained low all night with Motrin. We followed up with the pediatrician first thing this morning. She has an upper respiratory infection which more than likely caused the fever that caused the seizure. She is on antibiotics and has to remain on Motrin for the next 24 hours regardless if she has a fever. He did give us a script to have an EEG. His reasoning is more from her medical history than this occurrence. 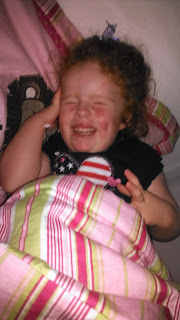 About two years ago while at our old pediatricians office she had what they called an "A typical" febrile seizure. She didn't seize but went totally limp. Since we were in the doctor's office at the time he just came in and saw her. He knew she was breathing and going to be OK. I on the other hand was not too OK. I am pretty sure I asked them for Oxygen once they said Calleigh didn't need it. He made me watch it and see how long it took for her to come around so if it happened again I wouldn't panic. I am pretty sure that is why I was so calm last night. I was freaked out but in my head kept saying it was a febrile seizure and she would be ok. With Calleigh's history you just never know. I have flash backs to watching her code in her hospital room when she was 8 months old after she had 1/3 of her large intestine removed. A team of doctors standing over her and feeling totally helpless. It is the worst feeling and I try not to go there. Thank you to everyone who helped us last night. The Belmar Police and Belmar EMT's were here when we needed them. They did an awesome job. A special thanks to George who when we weren't in the right mind to even think about it came in the ambulance and asked us if he could drive our car for us so when we got released we would have a vehicle. It was so kind of him. 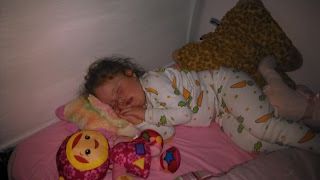 As I type this Princess Smoorcherella is napping comfortably in her crib. I can't help but check on her repeatedly but I guess that is understandable. She is totally back to her old self and I couldn't be happier. When we chose to give Cormac the gift of hearing we were so blessed to be surrounded by people who were supportive and believed in our choice. It was new to everyone in our family and friends. We did our research. We talked to professionals and recipients. We talked to representatives from the implant companies. We did not make this decision lightly. Choosing to send your child into surgery is never easy. CIs do not always work. They are... not for everyone. You are a good candidate if you were born with severe or total hearing loss. (The latter is rare. Most Deaf people do have some residual hearing.) You are a good candidate if you can hear some and you are familiar with the phenomenon of language. A doctour does an intake evaluation to determine if the odds are in your favour. There are a great many aspects to consider associated with this procedure. This list is by no means exhaustive. * sound comes through a "microphone"
* Deafs are especially opposed to having Deaf children "fixed"
So you don't know if CIs will be beneficial or not until you have them. That is the problem. I have only one adult Deaf friend who had the procedure done, and she is delighted with the results. But I would never recommend going by what one person says. I have heard of many people who were not happy with the results. As a Mother to a child with implants I find this information to be offensive. I would NEVER condemn someone for choosing not to implant their child even if I think it was the best decision I ever made. The above information is wrong which is the most infuriating. It is true everyone has a different journey once they receive an implant. It is not a quick fix. It takes work and dedication. That said, it is a miracle I witness every day. Cormac had NO hearing at all. There was no residual hearing to worry about. Many recipients can reteain their residual hearing while receiving an implant. New implant arrays have made this possible. Cormac is stll deaf. He will always be deaf when he is not wearing his implants. He is perfectly fine with who he is and proud of who he is. He would never shun a deaf person because he has implants and I think deaf people rejecting him because he can hear is just terrible. I think Cormac might be the most well adjusted, smart, happy kid I have ever known. As his Mother I feel I have given him the BEST opportunity in life he could possibly have. As his Mom I believe that is my job and responsibility. What scares me is other parents are reading all this wrong information and not having access to the correct information so they can make an informed decision for what is best for their family. I urge people to do their research and go out and meet people. Go to oral schools and watch these children TALKING and LISTENING just like typical kids their age. Contact me and I will gladly talk to you about the whole journey. On Friday, Cormac, was given a Virtue Award for Trustworthiness. When talking about being trustworthy the priest said these are the "kids you can depend on and the go to person". They are solid and reliable. I think that describes Cormac very well. Colin was upset he didn't receive the award because he felt he was just as trustworthy as Cormac. It made me sad he was so disappointed. I explained to him there will be more opportunites in the future for him to win an award. Ciaran was happy for Cormac and was not in the least bit upset over Cormac winning. There personalities are so different. Yep, my lil "shorty McCorty" has made it on the growth chart for THE FIRST TIME.....she is in the 3rd percentile. Sure, if you put her in a room of all kids her age 97% of them will be taller than her but there just might be someone shorter than her! 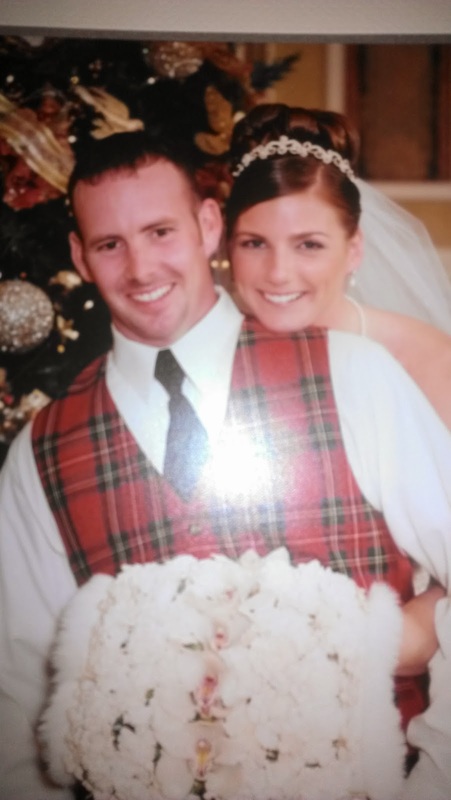 We have been meeting with an endocrinologist since Calleigh was about six months old. Her first year she hardly gained wait and didn't grow much. In December we went for testing to see if she is producing the growth hormone. She passed the test but barely. They measured four different levels and she failed three and passed one test by one point. This would disqualify her from being considered for growth hormones being covered by insurance. We were told to come back in six months to evaluate her status again. The only change we made in the past six months is to remove gluten from her diet. We have been sticking to it and she has only had gluten a few times. I don't know if it has anything to do with it but if growing is a side effect of being gluten free we will take it! Calleigh continues to make huge progress. Her speech is coming along tremendously. She is talking more and more. She still gets frustrated when she can't come up with the words but is doing much better finding her words. We also started her in private speech therapy with a therapist who specializes in children with low tone facial muscles. She has been pleased with her progress. She still struggles with her balance and overall weakness of her muscles. No one can seem to tell me why or how we can help her get better. She receives PT and OT at school twice a week and we also have her in private OT with a therapists who specializes in spacial relation and sensory issues. I have scheduled her for an evaluation with a therapist who specializes in Cuevas Medek Exercises. A friend of mine takes her daughter to him and he has worked miracles! No joke. Anyway, just wanted to update that my lil girlie is growing and we are so excited!